Pablo Picasso, a Spanish artist and co-founder of the cubist movement, is a name that never goes unheard when discussing art, or the history of Spain. He was born on the 25th of October 1881, and died on the 8th of April 1973. He lived through the Spanish Civil War and Francisco Franco regime. Picasso worked in various different mediums of art, including painting, ceramics, sculpture, and also writing. As a co-founder of the avant-garde cubism movement, Picasso created an entirely new style that ended up becoming an extremely influential style of art in the 20th century. Cubism is a style that involved representing three-dimensional forms in a more abstract manner. It is often seen as the first defined abstract style of art. It is also defined by the geometric forms used to create these abstract paintings. Picasso’s cubism in his work is seen to have been influenced by primitive African art. By challenging the conventions of perspective, Picasso created history. Below is an image of Picasso’s Les Demoiselles, which was painted in 1907 and influenced by African art. The style of cubism is distinctly visible in this image. I was first interested in Picasso’s work at the age of eleven, when my brother named my dog after Pablo Picasso. I began to research this famous Spanish artist, and was fascinated most by his use of color. Even today, when studying Picasso’s work, I think his use of color is extremely interesting, and something that is not analyzed in detail when often studying Picasso. Although his different styles of painting and sculpture are significant, his use of color adds significant character to his work. There are many paintings where he uses very little color, or dark colors, and many where he uses multiple bright colors. Below is an image of Picasso’s painting from 1932, Girl gone before a mirror. Along with the cubism style, his use of multiple colors makes the painting extremely appealing to a viewer. The use of the same pattern, but with different colors adds an interesting dimension to the two-dimensional piece. The drawing style of the figures is unique, and the color helps enhance this drawing style. I spent last summer in Madrid, Spain, and was fortunate to see Picasso’s Guernica (1937) live. The size of this painting in the Museum is huge, and the experience of actually seeing it in that scale is unreal. The painting depicts the harsh reality of war, which was a significant theme in some of Picasso’s work, and in his life, having lived through the Spanish civil war, and the cruel dictatorship of Francisco Franco. This piece, unlike many of Picasso’s works, has no color, and the use of black, white, and various shades of grey help convey the dark reality of war. This painting is also done with his cubism style, and it is an extremely interesting way of conveying the message, where the characters look cartoon like, but in contrast, he is depicting an extremely serious message. Ultimately, when looking at Picasso’s work, it is evident that his work transformed over time, and he developed unique styles that transformed the art world. It is also clear that a lot of his subject matter was influenced by the time period in which he lived, adding a different dimension to his work. "Before the Revolution." Smithsonian. N.p., n.d. Web. 05 Oct. 2014. "Cubism." - the First Abstract Style of Modern Art. N.p., n.d. Web. 05 Oct. 2014. "Guernica." Picasso, Pablo (Pablo Ruiz Picasso) -. N.p., n.d. Web. 05 Oct. 2014. "Heilbrunn Timeline of Art History." Cubism. N.p., n.d. Web. 05 Oct. 2014. "Pablo Picasso." 's Cubism Period. N.p., n.d. Web. 05 Oct. 2014. 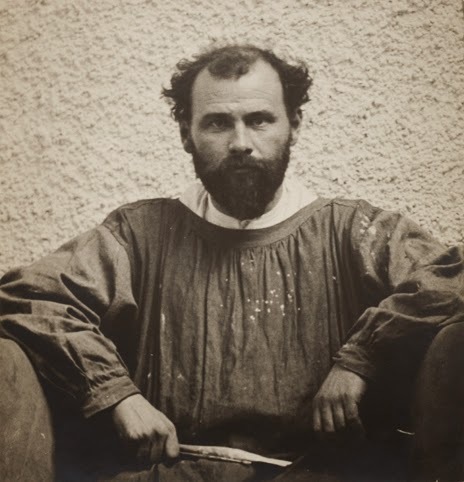 Gustav Klimt (July 14, 1862 - February 6, 1918) was an Austrian symbolist painter and one of the most prominent members of the Vienna Secession movement. Klimt is noted for his paintings, murals, sketches, and other objets d'art. Klimt's primary subject was the female body; his works are marked by a frank eroticism. Klimt's origins and background placed him somewhere between the "ordinary citizens" and the bourgeoisie. His clients, without exception, were from the aristocracy and the haute bourgeoisie. Though he was by no means handsome, he possessed an air of such assured masculinity that not even his famous painter's smock could make him seem unmanly or ridiculous. He wore a beard and his hair began to thin at a fairly young age. His heavy neck and highly colored complexion gave him the look of one who spent much of his time out of doors. Gustav Klimt's work was and is such that one can lose oneself in it. His women, ladies and girls are mere forms of nature itself, flowers, as it were, that he drew and painted as they budded, blossomed and withered. His approach to women was elementary. He is Zeus approaching Danae, he is a breath expiring over poppy-strewn meadows and summer gardens, a breath of life that knows death and invites it in. Hi is the groom embracing the smiling, dreaming bride, the omnipresent seducer on the wedding night, the father of children and the helpmeet in old age and death. He is all these things, albeit with neither literary detachment nor with classification in such categories as "sweet young things" and "femmes fatales" although they also presented themselves to him in this way in outward life, and although he met the limits of his Zeus-like existence in Emilie Floge, his Hera, whom he never married, but who kept him earth-bound in what was, to all intents and purposes, the extension of a strong maternal bond, even though she was the one who inspired him to symbolic portrayals of an "unearthly" love. 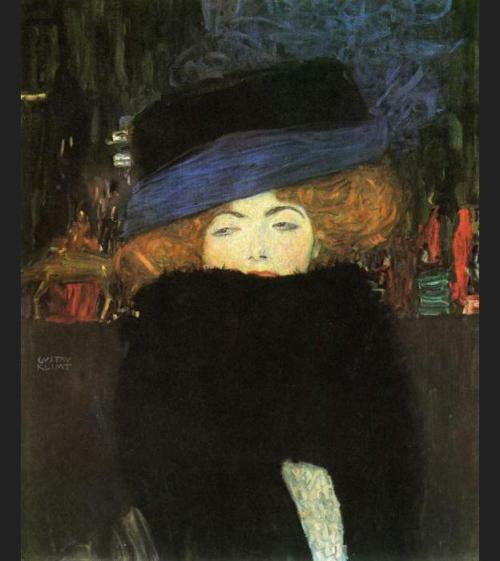 A Parisian flair surrounds this female portrait, which seems to turn the subject into the likeness of a modern cocotte. The young woman's eyes are turned to the left, the lids lasciviously lowered. The unknown belle's cool face, which she is partly concealing, is framed by thick sandy hair. The huge hat with the blue-violet scarf has been pulled slightly aslant. Klimt used a melancholy undertone in this painting. Klimt depicts the couple locked in intimacy, while the rest of the painting dissolves into shimmering, extravagant flat pattern.The two figures are situated at the edge of a patch of flowery meadow. The man wears a robe with black and white rectangles irregularly placed on gold leaf decorated with spirals. He wears a crown of vines while the woman is shown in a tight-fitting dress with flower-like round or oval motifs on a background of parallel wavy lines. Her hair is sprinkled with flowers and is worn in a fashionable upsweep; it forms a halo-like circle that highlights her face, and is continued under her chin by what seems to be a necklace of flowers. By rendering visible the various manifestations of "woman", Gustav Klimt came tantalizingly close to defining the "modern women" as independent and in control of her own eroticism. The women's movement was to lead girls and women through the revolution of their daily lives, but it was artists like Gustav Klimt who led "sweet young things" and "femmes fatales" alike towards the "path to freedom" by recognizing the power of eroticism and lifting its taboo. Natter, Tobias G., and Gerbert Frodl. 2000. Klimt's Women. New Haven: Yale Univeristy Press. The period between 1880-1886 was known in Van Gogh’s legacy as his Dutch period. This specific period stood out to me in Van Gogh’s work due to the stark differences seen in his painting and drawings compared to previous works and works that followed this era. This was clearly a dark time in Van Gogh’s life, one in which his work reflects overriding concerns for his fellow men and women of the time. The subjects used were often miners, peasants, farming households and houses for the poor. Vincent Van Gogh’s Worn Out (1882) piece really encompasses the dark and dreary time in Van Gogh’s life. The bolded dark figure takes up the whole page, protruding out into the foreground with no real background noticed. 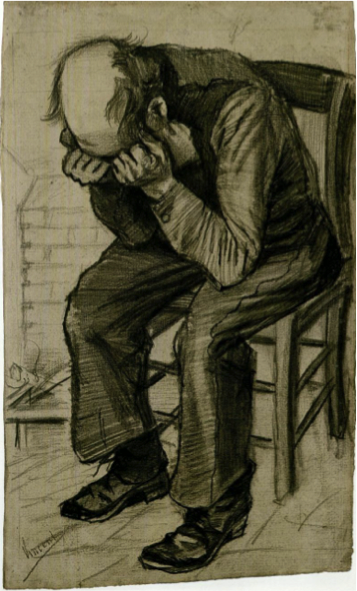 The piece reflects a burden not only from the body positioning and language of the male sketched but also in dark lines observed in the shading of the figures body. 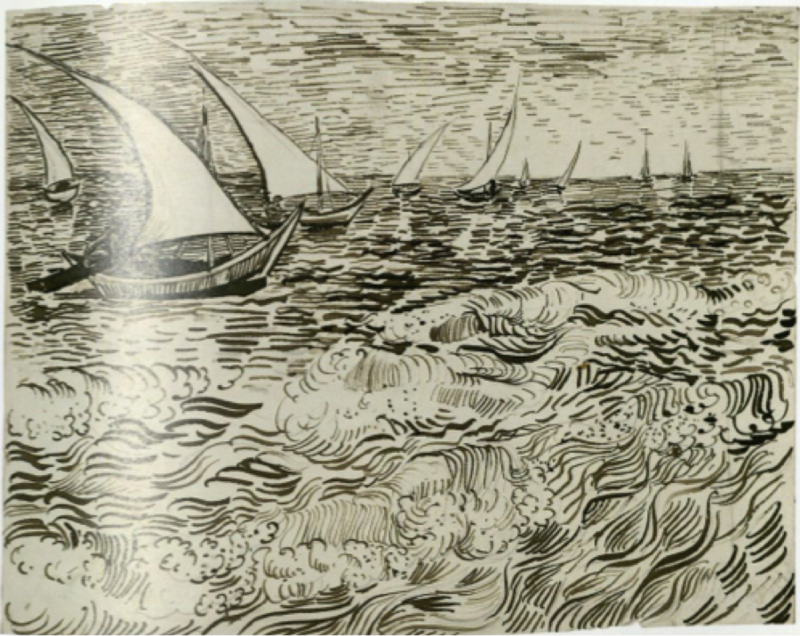 This second piece of Van Gogh’s Boats at Sea (Mid-July 1888), starts to reflect the style of art many viewers are accustomed to from Van Gogh, one of light, warmth and color. Instead of the dark straight lines observed in the previous pieces, this picture starts to have flow as well as a feeling of light and ease from the curved, non-uniform lines observed. The last Picture I chose from this particular era was my very favorite. Van Gogh was a master of sunflowers; some of his very best pieces encompassed them. It is interesting that even in Van Gogh’s “dark era”, he still found a way to utilize the sunflowers in his pieces. 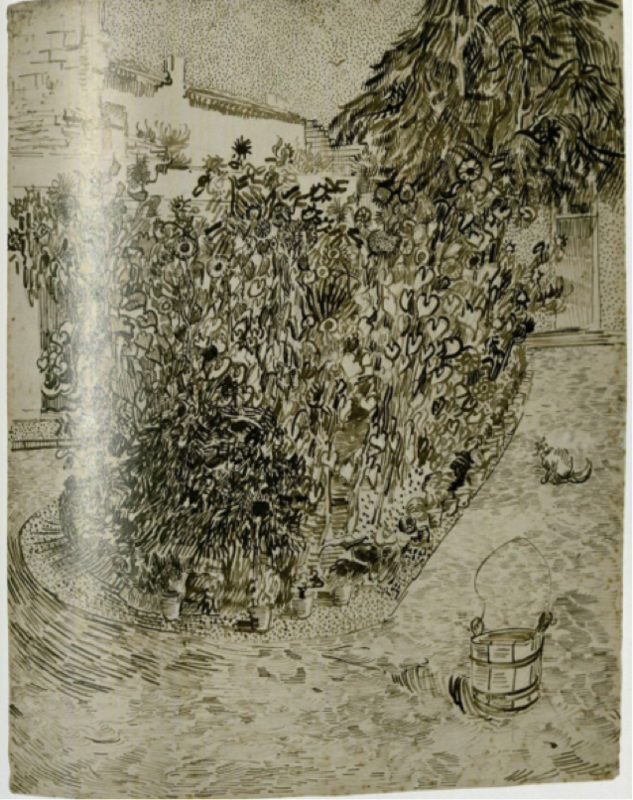 This may lead us to infer that the sunflowers depicted in this piece signify an optimism and excitement in Va Gogh’s life, his depression had lifted at this point. The first of many amazing pieces involving sunflowerd for Van Gogh. Michelangelo Buonarroti, born March 6, 1475 in Caprese, Italy, was destined to be a great man. Painter, draughtsman, sculptor, architect, engineer, and poet, Michelangelo went against his father’s wishes to be a businessman and entered an apprenticeship at the age of thirteen in the workshop of painters Domenico and Davide Ghirlandaio . At fifteen, he lived with and worked for Lorenzo de Medici as a sculptor, completing the marble reliefs Battle of the Centaurs and Madonna of the Stairs. In exchange for a wooden Crucifix, the prior of Santo Spirito Hospital allowed Michelangelo to draw and make studies of dissected corpses . 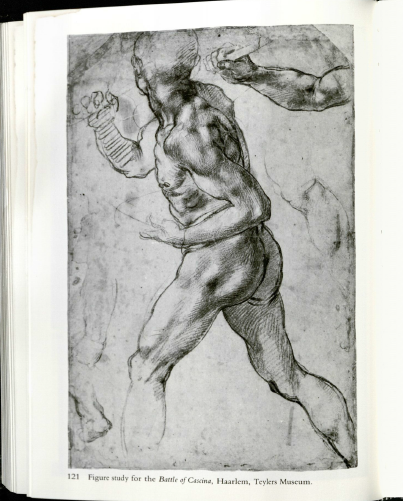 Not only did Michelangelo better understand human muscular anatomy as demonstrated in the drawing below, Michelangelo’s work involved a more dramatic religious intensity . After the Medici’s were removed from power and the Florentine Republic was re-established, Michelangelo traveled to Rome for the first time in 1496 . Following the creation of the acclaimed Pieta and many other sculptures, Michelangelo returned to Florence known as a fine sculptor. 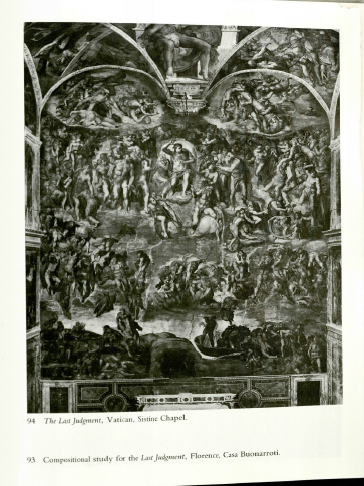 It wasn’t until 1508 that Michelangelo was commissioned by the pope to paint the vault of the Sistine Chapel . 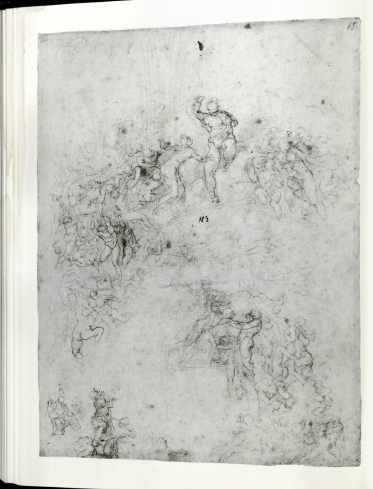 Seen below are Michelangelo’s drawings of the Last Judgment that spans the altar wall of the Chapel . Michelangelo’s beautiful depiction of muscular apostles and heavenly angels lends itself to his study of cadavers earlier in his life. Reproductions of the Creation of Adam from the Sistine Chapel Ceiling have broadcast an image of his art as expressive of superhuman power . Michelangelo’s depiction of such beautiful religious scenes exemplifies his most defining characteristic, terribilitâ, which is a term indicative of heroic and awe-inspiring grandeur . Eight years ago, my first sight of the Sistine Chapel gave me the chills. I’m positive that every spectator of such detailed, inspiring work feels the same response, founded in awe and, in secret, jealousy. Hirst, Michael. Michelangelo and his Drawings. New Haven & London: Yale UP, 1998. Print. "MICHELANGELO." Benezit Dictionary of Artists. Oxford Art Online. Oxford University Press. Web.7 Oct. 2014. <http://www.oxfordartonline.com/subscriber/article/benezit/B00122309>. Anthony Hughes and Caroline Elam. "Michelangelo." Grove Art Online. Oxford Art Online. Oxford University Press. Web. 7 Oct. 2014.<http://www.oxfordartonline.com/subscriber/article/grove/art/T057716>. Paul Cézanne was a French artist born on January 19, 1839 in Aix-en-Provence, France. Although known as a Post-Impressionist painter who used small brushstrokes used to make large detailed fields, it can be seen through his sketches and drawings that Cézanne carefully studied his subjects. He knew the importance of drawing in order to be a successful painter. He had over eighteen sketchbooks, in which he obsessively sketched items around him. Two of them are even published in Lilly Library! Three are shown below. Cézanne’s father founded a banking firm, making a fortune that Cézanne eventually inherited. Therefore, unlike many artists, money was not an issue. He first began studying drawing under Joseph Gilbert at the Free Municipal School of Drawing in his hometown, and continued his drawing lessons at the University of Aix-En-Provence while attending law school there. In 1861, Cézanne moved to Paris to follow his dream of becoming an artist, where he became friends with an Impressionist painter known as Camille Pissarro. Together, they grew as artists. In his earlier work, Cézanne is very concerned with the main figure in the landscape. They are the focus of the painting and are done very heavily with great importance. This can be seen in some of his earlier paintings, such as Dominique Aubert, the Artist’s Uncle, as a Monk, painted in 1866, and Skull and Candlestick, painted in 1866 as well. These paintings both show the great attention Cézanne gave to painting the objects of the painting, while neglecting to do much with the background. Cézanne moved to Pontoise, France, in 1872. During this time, he worked closely with Pissarro and began to focus on drawing and painting exactly what he saw in nature. As he matured as an artist, Cézanne focused more on painting realistically from observation, but always had some trouble doing so. This lead to his style of simplifying objects to their basic geometric shapes and color planes. He painted them observationally, rather than imaginatively, in his later works, leading to lighter colors and strokes. This can be seen in The Gulf of Marseilles Seen from L’estaque, painted in 1885. The buildings and mountains are quite geometrical, and the painting is done in almost sheets of color. There is a definite lightness in the brush that was not present in the works shown above. Apples and Oranges, painted by Cézanne in 1899, is a beautiful piece of art that demonstrates his newfound attention to the color and detail of the background, as well as the geometric shapes that can be seen even throughout the folds of the blankets. Paul Cézanne went through a period of seclusion where he lived in isolation for many years, and even went almost 20 years without showing his work due to his misalignment with other Impressionist drawings and the fact that a lot of his work did not receive great reviews from the public. However, he began to remerge in his last twenty years before dying of pneumonia in 1906. I chose Paul Cézanne because I am very interested in French and French culture and history. I remember hearing about him in French class growing up in high school. Since French was my favorite class, I immediately became interested in his work. His art and life surrounding his art was influenced by the politics in the country at the time. I also find Cézanne inspiring and relatable as a person because he denied the wishes of his parents to pursue his dream of being an artist in Paris. Eventually, his father saw that he was doing what he loved and they made amends. Cézanne’s story and success is a good reminder for me and others my age that passion drives success, and to reach to attain your own goals even when those that you look up to disagree with your decisions. His careful study drawings done in more than eighteen sketchbooks that he kept, showing the importance of keeping a sketchbook and practicing drawing to master all forms of art. I felt this is a perfect lesson to keep in mind while taking Drawing! Cézanne, Paul. "Apples and Oranges." ArtStor. 1899. Web. 8 Oct. 2014. Cézanne, Paul. "Dominique Aubert, the Artist’s Uncle, as a Monk." ArtStor. 1866. Web. 8 Oct. 2014. Cézanne, Paul. "Skull and Candlestick." ArtStor. 1866. Web. 8 Oct. 2014. Cézanne, Paul. "The Gulf of Marseilles Seen from L’estaque." ArtStor. 1885. Web. 8 Oct. 2014. Cézanne, Paul, and Theodore Reff. Two Sketchbooks: The Gift of Mr. and Mrs. Walter H. Annenberg to the Philadelphia Museum of Art : [this Book Is Published on the Occasion of an Exhibition at the Philadelphia Museum of Art, May 21 - Sept. 17, 1989]. 1989. Lilly Library. Print. "Paul Cézanne." Bio. A&E Television Networks, 2014. Web. 08 Oct. 2014. Rewald, John. Paul Cézanne; a Biography. New York: Schocken, 1968. Print.